Hannibal Barca stands as one of the great military leaders of the pre-Christian era. He was born in Carthage (present day Tunisia) in 247 B.C.E. His father Hamilcar was the political leader of Carthage and led the city-state in the 23-year first Punic War (264-241 B.C.E.) against its Mediterranean rival, Rome. 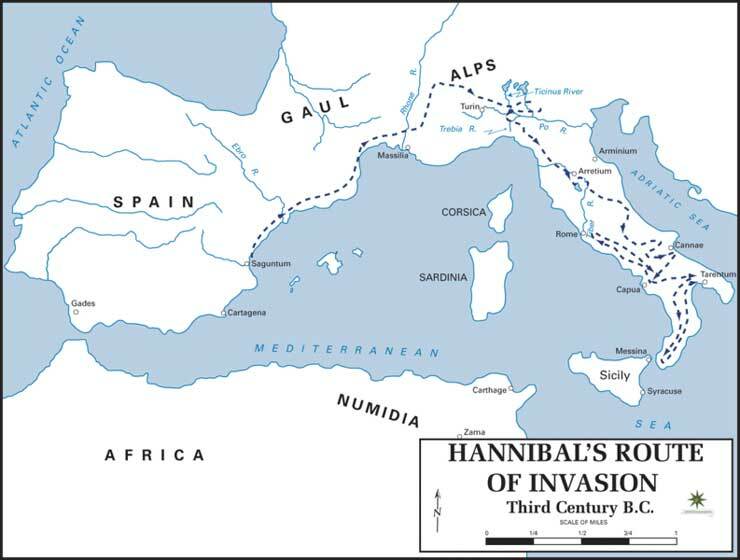 Upon assuming power in Carthage after the death of his father in 228 B.C.E., Hannibal continued the conflict with Rome. In his first military campaign at the age of 25, Hannibal led troops to Spain to increase Carthaginian power on the Iberian Peninsula. In 219 B.C.E. Hannibal attacked Saguntum, a Spanish city friendly to Rome, prompting the Romans to declare war on Carthage the following year, initiating the second Punic War in 218 B.C.E. In order to defeat Rome, Hannibal launched a bold plan to attack its enemy from the north. Early in the war, Hannibal astonished the Romans with daring maneuvers including leading approximately 60,000 troops across the Pyrenees Mountains that separated modern day Spain from France. He marched across what is now southern France, crossed the Alps Mountains, and entered Roman Italy, reaching the Po Valley in late 218 B.C.E. While in France he recruited Gauls (also called Celts) who were enemies of Rome. 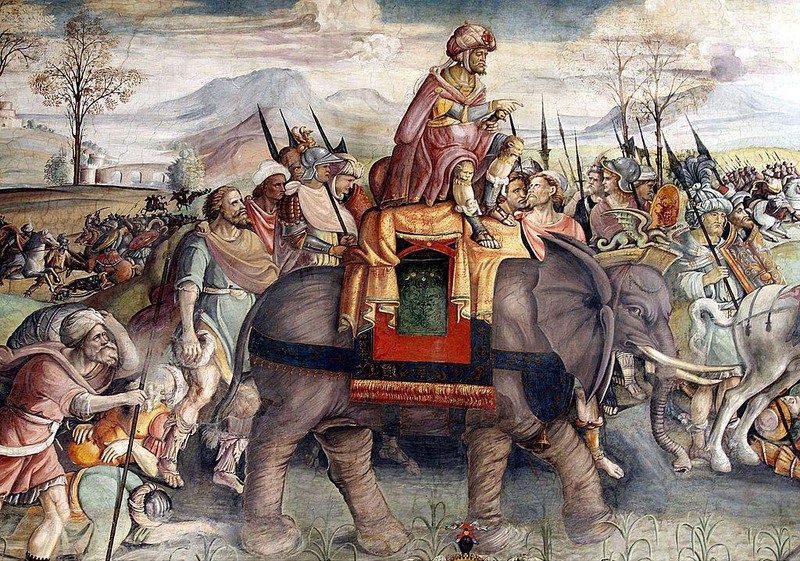 In 15 days, Hannibal marched through the Alps with his army and 37 African elephants. Elephants intimidated Roman legions, shattering their lines and causing chaos among soldiers. With his allies the Gauls, Hannibal’s army that crossed the Alps totaled almost 90,000 soldiers, making it one of the largest military forces ever assembled. Although he lost nearly half of his army in the Alps crossing, Hannibal nonetheless defeated the Romans at the Trebbia River, in the first major battle of the war fought on Roman soil. In 217 B.C., Hannibal moved on to central Italy, ambushing another Roman army on the shores of Lake Trasimeno. In 216 B.C.E. although outnumbered by the Romans at Cannae in southern Italy, Hannibal arranged his troops in an arc formation and with the help of his cavalry again defeated the Romans. The Carthaginians killed about 50,000 enemy troops in one day in the worst defeat ever suffered by a Roman army. Cannae would be the last victory for Hannibal. The allies he gained in southern Italy deserted him while the Romans and their allies prevented reinforcements from reaching his forces. Meanwhile the Roman General Publius Cornelius Scipio drove the Carthaginians out of Spain, and invaded Africa in 204 B.C. Hannibal was forced to return to Carthage and was finally defeated by Scipio at Zama in 202 B.C. The war ended the following year. After the war, Rome allowed Hannibal to govern Carthage but confined its power to the city and immediate surrounding territory. With Hannibal heading the government, Carthage made a rapid military and political recovery. Threatened by his growing power, the Romans demanded that he retire. Hannibal moved to Ephesus (Turkey) and became a military adviser to Seleucid king, Antiochus III. In 190 B.C E., he commanded a Seleucid (Greek) Empire fleet and engaged in war with Rome’s ally, Pergamon. Hannibal was defeated. Determined not to fall into enemy hands, he fled. In approximately 183 B.C.E. at Libyssa in present-day Gebze, Turkey, Hannibal took his own life by ingesting a vial of poison. Arthur M. Eckstein, “Hannibal,” The World Book Encyclopedia (Chicago: World Book Inc; a Scott Fetzer Company. 1995); Daniel A. Fournie, “Over the Alps to Rome Gates,” Military History Vol. 21, Issue 7 (March/April 2005); Richard A. Gabriel, “Why Hannibal Lost,” Military History. Vol. 33, Issue 1 (May 2016); “Hannibal Biography,” Biography.com, https://www.biography.com/people/hannibal-9327767.